Holiday houses of Slovenian Istria is a product that arose from our enthusiasm, young-spirited character, inexperience and our desire for innovation. The basic idea we stemmed from was to offer the tourists, who come to visit the Slovenian Istria, different or alternative lodging opportunities. Our premise was, that all hotel rooms, globally speaking, look really similar. You can be travelling to New York or Rome, and when you wake up in your hotel room it does not really give away your location at first. This is exactly what we wanted to surpass. We wanted to portray the image of Slovenian Istria to our guests in their rooms. In addition to the regular rooms and suites we decided to offer an alternative accommodation, which would be in line with sustainability principles and would become an experience in itself. The idea for the holiday homes was created as a result of an increased demand to enlarge the tourist capacities and as a new opportunity for adventure in Slovenian Istria, that would attract new tourists and buyers and place our small town on the tourist map of Slovenia. They were built after four years of intensive action in expanding the existing accommodations. We were aware of the need to expand or change, which would deviate from the average and provide new experience for all. All tourist trends were pointing to the development of alternative forms of accommodation and the returning back to nature. The important element that we added to the houses is their story ̶ the story of Šavrinke women. Without this story, our holiday houses would only be houses with a wonderful view of the Gulf of Trieste. The story about the Šavrinke women makes these houses the central stage for the old and the new to meet, where the life stories of our grandmothers can live on and make us think about the commodities and freedoms we enjoy today and how they are not just an automatic right. Slovenian Istria has always been considered as the crossroads of cultures, ethnicities and languages. As a result of harsh and bad conditions for agriculture and famine, the area experienced a large exodus, particularly in the past century. Consequently, a very specific identity profile developed here, reflecting itself in the character of the Istrian people. Specifically, stubbornness, resourcefulness and the desire for a better future are the main characteristics of our grandmothers, known as the Šavrinke women. Those were brave, fearless women, who often had to take the reins, feed many and provide for the whole family. Several times per week they would make rounds to bigger cities and try to sell their produce at the best price to the city folk. They would sell anything they could gather from the neighbouring villages, and frequently, due to the strictly guarded border between Slovenia and Italy, they had to smuggle these products. In memory and honour of the brave acts these women did, we decided to name our houses after them, namely Jajčarica (Egg lady), Krušarica (Bread lady), and Mlekarica (Milk lady). The houses imitate the old Istrian houses by design but also the colours of the façades are replicas from the times of the Second World War in Istria. They are furnished with the original antique furniture ranging from the end of the 19th century and the Second World War. 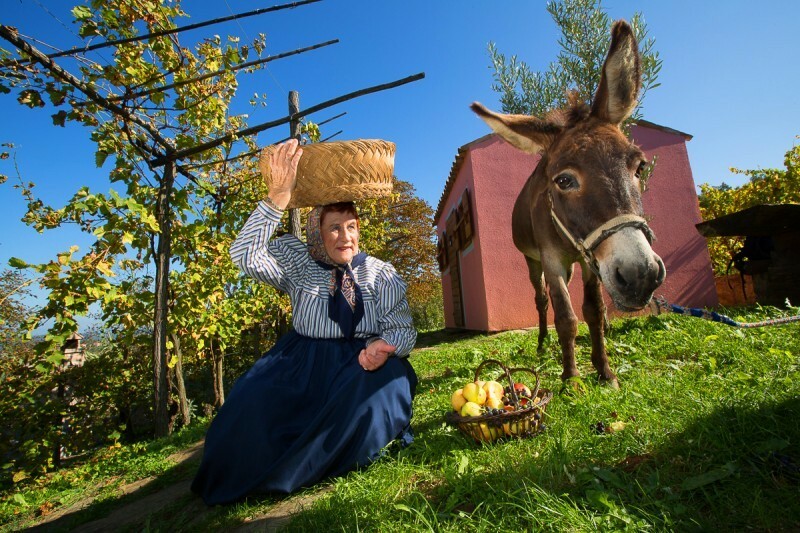 Each house is also equipped with a brief historical description of Istria, the Šavrinke woman and their story. From the very beginning, protecting the environment is one of the key tasks we set in our work. We have implemented many regulations and practices in the working operation of the houses, such as reusing the old furniture, strict waste recycling and reducing the consumption of electrical energy and water. The social and cultural aspects of the project are prominent primarily in its efforts for the preservation of the cultural heritage of our ancestors and the historical presentation of Slovenian Istria, readily available to all the tourists who visit the houses. It is also important to note that the project not only strengthens and facilitates the respect of traditions, it also maintains the quality of life within the local community. Economically speaking, the project contributed in making the destination more desirable, and at the same time had a direct effect on other surrounding subjects, such as wine and olive growers, farmers, restaurateurs, tourist guides, etc. These effects are multiplicative and difficult to measure; however, they are definitely positive. In June 2017, the Holiday houses of Slovenian Istria were, as the first accommodation of its kind in the Slovenian Istria, awarded the international Gold Travelife certificate, which covers environmental protection incentives, respecting the employees, local community and its inhabitants, and respectful attitude towards natural and cultural heritage and promoting the local population. The certificate signifies additional commitment to our work towards a sustainable development of tourism. There were numerous elements that contributed to the success of our project. First and foremost, it was the contest of the Municipality of Koper for the development of ideas, which encouraged new ideas and provided tutoring or assistance in preparing a business plan for the winner. A prerequisite for participation in this contest was applying to a tender called Snovalec, under the auspices of the Slovenian Tourist Board. Clearly, the news of our project being the winner became public very quickly through the media and the responses of the public varied, most of them were positive, some were negative. It was uncommon to expect that a young and inexperienced businesswoman could be able to implement major projects. However, and according to the words of John Donne, no man is an island, so we managed to realize the project with the help of our families and our “Istrian stubbornness”. The award from the Snovalec tender was an important recognition for us, that also alerted the media to us and gave us the opportunity to present ourselves to the general public. This marked an important event, and the marketing effect ended up being much larger than anticipated. The story spread, gaining a big media impact. Apart from the newly built Holiday houses of Slovenian Istria, even our previously owned standard accommodations, fit for people who are not willing to give up on the basic comfort (rooms with no electricity or bathroom), were filled thanks to the houses and their media story. We now reach full occupancy for the houses during the summer months, and during the spring and autumn they reach full occupancy during the weekends. With the desire to achieve a higher occupancy outside of the main season and to round-up the tourist destination of Slovenian Istria, several accommodation providers joined in a tourism cooperative called Zakladi Istre d. o. o. (The Treasures of Istria Ltd.), where we are now preparing a common marketing strategy. In addition to our new accommodation offer, we now serve also the so-called Istrian breakfast. It consists of exclusively home-grown produce and products and is delivered to our houses on the agreed hours. The ingredients are bought from the local farmers and various manufacturers located across Istria. We would now like to expand this idea and deliver those breakfasts to other accommodation providers. In addition to its authentic food ingredients, the breakfast package would also include information about the cultural and gastronomic identity of Istria and suggestions for visiting local farms and attractions. Holiday houses of Slovenian Istria is a project that will continue to live on as it does today. Surely, there is always room for improvement. The most important thing is that we take every situation as a learning experience and use that acquired knowledge in the future. In the near future, we plan to upgrade the existing houses and extend our offer, which will further enrich our destination, the Slovenian Istria.